Recently I held the future in my arms when our two young friends Nic and Jenny stopped by with their new baby, who they have named Magnolia Leigh. Magnolia was 6 days old and weighed 6 pounds. As I held her, she was so small that her fingers could not wrap themselves around my one finger. Holding her I thought about what lies ahead for her in her lifetime and how much the world will change during that time. I reflected on the changes I've seen in my lifetime and thought of one of my earliest recollections, a horse-drawn streetcar on Franklin Ave. in Hollywood, Ca. in the late 1920s. I compared it to an email I received the other day of a 50-passenger rapid transit bus in Dubai. It is electrically driven and cruises with 50 passengers at 150 mph. At that speed I hope it never hits a camel. I was 10 when someone invented the rope tow and now look at what skiing has to offer. No more hanging onto a wet and sloppy Manila hemp rope or even a frozen one of Nylon or Dacron. Today you can climb into a detachable quad chairlift and ride 3,000 vertical feet in a few minutes. Or you can ride a 6-passenger chairlift at Boyne Mountain in Michigan. 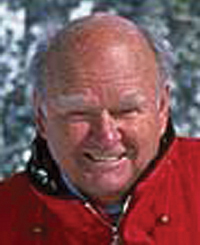 I started skiing just a few years after the metal edge was invented, I believe by Walter Prager's brother. Walter used to be the coach of the Dartmouth ski team. He rocketed to fame in Davos, Switzerland by winning won the Parsenn Derby by almost 20 minutes. It was a 12-kilometer downhill with no gates except a start and finish gate. He put brass edges on one side of his skis and steel edges on the other because all of his left turns would be on ice and his right turns would be on corn snow. That shows the progress we've made. I've seen the disappearance of "Learn to Ski Week." There was a time you could buy a round trip train ride from Chicago to Sun Valley and return, get all of your meals, lift tickets, and lessons for $17 less than an all-day lift ticket costs today. That 6-pound, 6-day old little girl named Magnolia will see just as many inventions and revolutions in her lifetime as I've seen in mine. I watched Dave McCoy invent Mammoth Mountain and stood by while Alex Cushing in 10 short years made Squaw Valley grow from a resort with a single chairlift and 2 rope tows when I taught there in 1949-50, to become the host of the 1960 Winter Olympics. I watched the days of untracked powder in the back bowls of Vail become tracked up within an hour of when the first skiers arrived at the top. Many of the inventions we now take for granted. They are things like snow tires, automatic transmissions, snowboards, warmer winter clothes, and instant snow reports from anywhere in the world with only a couple of strokes on the computer. I'm on the far end of the good invention cycle of my lifetime, though there are still a lot of things yet to invent. What about a powder snow pill that you could throw out in front of you when you are skiing that would change the snow to untracked powder wherever you wanted to ski? Magnolia, or Maggie as we're now calling her, will be able to learn to ski almost instantly because ski equipment has become so user friendly that 4-year-old kids are already running slalom gates and riding rails in a snowboard park. She has a wonderful opportunity to enjoy her freedom at an early age. Her father and mother both worked at Mt. Baker when they met, and got married at the end of our dock in Deer Harbor, Wash. on a rainy summer afternoon. I'm sure Magnolia with Jenny and Nic's guidance will profit by the inventions in her lifetime, just as I have during my lifetime. I'm right now looking forward to my next 50 years of what is around the next bend. I am sure that Jenny, Nic and Magnolia will be leading the parade.